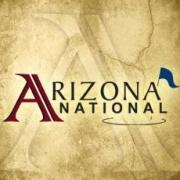 Arizona National Golf Club is a desert style semi-private golf course located in Tucson, Arizona. The course originally opened in 1995 and was designed by Robert Trent Jones Jr., it features bentgrass greens and bermudagrass fairways. The course consists of five Par 3's, nine Par 4's and four Par 5's and plays to a maximum distance of 6785 yards with a course rating of 72.4 and a slope of 146 over 18 holes. Four sets of men's tees and a single set of ladies' tees create an enjoyable test of golf for players of all abilities. Rental services are available including motorized carts with GPS navigation units and golf clubs. The practice area at the facility includes a full service driving range and separate chipping/putting greens. Food and beverage options include a restaurant with full service bar and an on course beverage cart. Beautiful layout among the Arizona mountains. Price was fair .